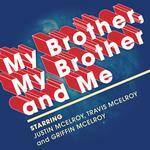 My Brother, My Brother And Me: MBMBaM 411: Face 2 Face: Bon Voyage! "The last season of capitalism". Fingers crossed, Ditto, fingers crossed. I need Paul to make all my drinks, seems like the boy really knows how to make them strong. I really hope Paul doesn't feel that bad about the Garfield thing. Oh, also? Can we take a moment to reflect on just how good these good, good boys are? How much effort they put into getting enthusiastic consent from everyone who was involved in the show? And how they did this, not just because they recognized it was right, but because they sincerely cared that everyone was happy and comfortable? These good, good boys. So good. I went to the Phoenix show, which was just two days after this one. I had such an amazing time with them during that hour and a half, and I'm a little embarrassed by how sincerely and deeply I miss them. I looked up the furniture store. The pups are cute, but sometimes ... look, it happens, a guy dog gets old and he sits funny! C'mon, give the old boy his dignity! Still, they have a pretty funny social media presence, and if I were in the market for new furniture near there, I'd definitely browse. I was at this show!! It was indeed amazing. And yes, meese, I totally x1000 your comment. They are SO about getting consent and making sure everyone is having a good time. If the swearer-to-be in the last segment (I forget her name) hadn't wanted to come down and speak into the microphone, it would have been TOTALLY FINE. There was no pressuring and there would have been no boo-ing. The McElroys would have come up with another funny way to end it with everyone feeling good. That was my biggest takeaway from seeing them live -- they are so good at reading, molding and leading the audience on this hilarious, imaginative journey together. Justin was most noticeably doing this but all three of them (plus Clint who did the intro!) were in on it. It was a live experience unlike any other show I've been to. Hope to see them many, many more times! P.S. I'm sure everyone on this thread always knows this but in case you didn't, Justin and Sidnee did a really good episode of Sawbones about mental health and got really personal. Highly recommend. Just another reason that this family is top-notch. You got a Sawbones???? We didn't get an opening act. Joyfully confirming enthusiastic consent every step of the way was the thing that stuck out for me in this episode, too, and the new question system is such an improvement. Could this be one of the promo pics they were talking about? I bet so. I'm in the habit of not listening to the Q&A for their live podcast recording because they make me cringe (at any live show, not just theirs). Is it safe? Oops, meese, we didn't get a Sawbones in SF -- I was referring to an episode that they just posted but didn't make that clear! You can find it in the Sawbones recent episodes. The Corpse in the library: they recently adopted a new policy of having question-askers email the question during the show break, vetting them and inviting a select number of people up to the mic. It has been going really really well. SO much less cringy and, in the case of this particular show, the last question is pretty damn awesome. They've been working on streamlining the Q&A segments for a while, trying to find a way to hold people to asking straightforward questions. The cringe moments have really been dialed back since, I'd say, last fall.